To wrap up London Fashion Week, it only seems apt to write about the thoroughly British (and frankly, since the namesake's death, sometimes overhyped and borderline cliche) brand -- Alexander McQueen. Their Fall/Winter 2012 collection, as always, did not disappoint. 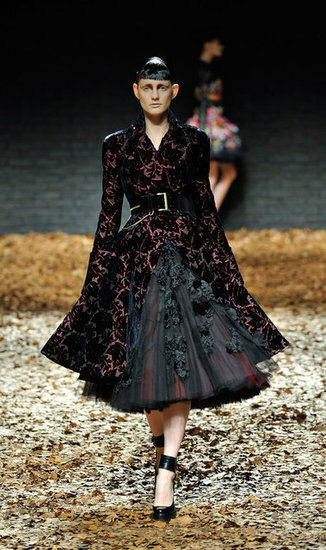 I must say Sarah Burton really has done an amazing job filling in McQueen's big shoes. It was a collection of dark, lush fabrics and dramatic hourglass shapes (highlighted by a strong belt and full A-line skirts). 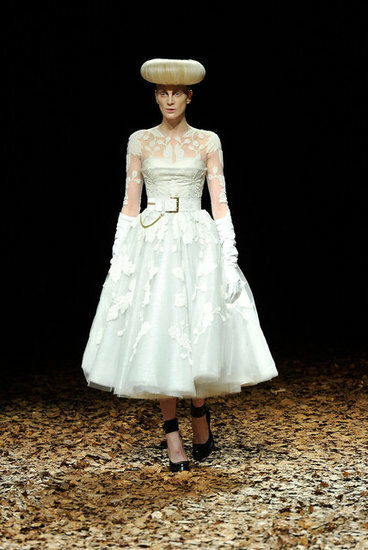 Intricate tulle and lace details were balanced by luscious, buttery velvet and boots laced up to the thighs. And to prevent it from being too pretty and boring, the collection was topped off with bold hair, thinning faces and jutting cheekbones -- just the perfect amount of McQueen edginess.